It is clear that mechanical forces and structural cues influence cell behavior by regulating signal processes. These signals go on to alter gene expression and reorganize the cytoskeleton and extracellular matrix (ECM), resulting in an orchestrated cellular response. The process by which mechanical stimuli are transmitted into the cell, to exert the aforementioned effects, is termed mechanotransduction. 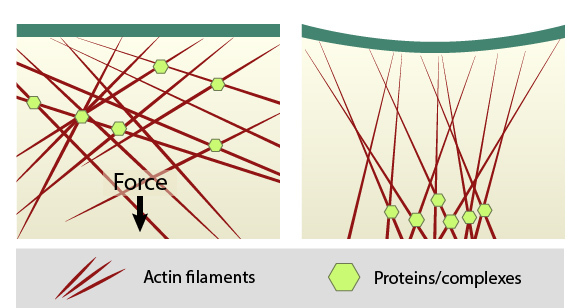 When sources such as contractile stress fibers generate internal cell force(s), the force is transmitted throughout the array of actin filaments (shown in red). Mechanosensors, proteins, or complexes; (shown in green) that are linked to the cytoskeleton network can be locally concentrated. Thus, force not only causes direct deformation of mechanosensors to modify their activity, but clustering may also promote mechanotranduction by modulating enzyme kinetics, enzyme and substrate binding, etc. The cell membrane may also distort at sites where the cytoskeleton is linked to the plasma membrane, thereby influencing mechanosensors at the cell surface. Cytoskeletal filaments are suggested to transmit local stresses over long distances , and as such the cytoskeleton and linked extracellular matrix (ECM) are proposed as a means to focus force upon molecules that can transmit mechanotransduction (reviewed in ). The manner in which mechanical stimuli are transmitted into the cell is dependent on the coordinated activity of mechanosensors. The activity of these mechanosensors and subsequent signal integration is influenced by resting tension levels within the cell, which are set by the cytoskeletal system , (reviewed in ). The cytoskeleton is therefore a primary factor in facilitating mechanotransduction. The adaptive cytoskeleton deforms through assembly and disassemby of its filaments in response to an applied force. This is akin to other dense sol-gel networks, which have monomers in solution and polymers coexisting in rapid equilibrium. This characteristic allows the cytoskeleton to shift through different physical forms (i.e. phase transitions) in the absence of a biochemical mechanism . In general the application of force on an object can result in two different outcomes dependent on whether the object is attached to another structure or not (as reviewed in ). If unattached to anything else, an applied force will result in acceleration i.e. the force is translated. This is rarely true in a cellular context. If an object, such as the cell, is attached to another structure or surface, an applied force results in stress. Stress can lead to a mechanical distortion, presented as a morphological and/or structural change. All bioactive molecules have extended and contracted forms, structural rearrangements, and nanoscale variations in their motion in living systems ,. Forced-induced conformational changes and/or altered assembly occurs in the cytoskeleton, focal adhesions and ECM components ,,,. Mechanosensory molecules (mechanosensors) have a broad set of structural regions or motifs that can be altered over a range of mechanical forces (as reviewed in ,,). Forces can cause protein unfolding or unraveling to expose otherwise ‘hidden’ domains that regulate or control catalytic activity. Forces can structurally expose protein-binding domains (i.e. protein domain movements) for other structural components or signal transduction proteins. Forces such as thermal energy, pressure, and rigidity can alter tension across membranes to modulate mechanosensitive ion channels. Force can influence the assembly, stability and turnover of receptor-ligand complexes and functional module components. Force can bring molecules or complexes together to increase their local concentration. This clustering may augment or regulate the activity of the individual components.